There is a big push in the industry towards automation – and for good reason. IT departments are being tasked to do more with less, and automation enables them to do that. A lot of the focus on automation is around DevOps, configuration management, and enabling self-service application deployment. A lot of the tools to support these areas are built for larger enterprises where there is a need to build up or scale out production applications quickly or deploy full application stacks for testing. It makes sense to automate in larger enterprises as there are a lot of benefits. It enables IT to be more responsive to the business and internal customers. Giving developers the tools to deploy their own application stacks frees up sysadmins to work on other tasks, and there is usually a resource or two that can become an expert on the automation and find ways to utilize it to drive more value out of it. But what about smaller environments? IT staffs are usually pretty small and focused on putting out the fires before they burn down the facility. Procedures aren’t always well defined or even defined enough to automate a task. They’re probably not deploying a lot of new applications or servers for production or development environments, and the applications that are deployed most likely benefit from scaling servers up rather than scaling out. Automation tools like vRAC and Puppet Enterprise are usually too complex and too expensive for this space, and even if the budget is there, the business case isn’t. And yet the SMB space is probably the space that can benefit from automation the most. So how can they utilize their limited resources to do more with less? Understand where you will get the most value from automating – There are still tasks that you need to do on a regular basis, or there are infrequent tasks that are time consuming. Maybe its provisioning, or terming, a new user. Maybe its creating mailboxes in Exchange or running a report manually. There is value in automating these routine tasks, and you will recover the time you put into it pretty quickly. Document your processes – As you run through a task that you plan to automate, put the process down on paper. You can’t automate a process if you don’t know how it should run. Documentation can also help with troubleshooting after you’ve automated the process. Start Small – Rome wasn’t built in a day, and it takes time to program and troubleshoot a script. Start small by automating the most common or time consuming parts of the task and then add features as you have time or need them. Avoid Scope Creep – It’s easy to get carried away as you start to automate tasks and processes. But if you’re not going to get any value from automating a task, move it to the bottom of the list. The last thing you want to do is to spend so much time on a low-priority task that other, higher priority tasks slip. Don’t Reinvent the Wheel – You can find script repositories and tutorials for many tasks in just about any language. Use these as a base and modify them to fit your environment rather than writing something from scratch. Dedicate Time – Time is a premium commodity in the SMB IT departments that I’ve worked in. Automating frequent and/or time consuming tasks will be a net time gainer, and you will gain that time back down the road. Earlier this week, Gina Minks posted an article called “The 1st Story I Never Wanted to Leave.” John Price also posted about this today. I thought the concept was fascinating, and I wanted to share something in this vein. I was an avid reader when I was growing up. I was often reading something, and I loved hanging out in the Sci-Fi section of my local Barnes and Noble. The book that really stands out to me is Red Mars by Kim Stanley Robinson. I don’t remember exactly when I read Red Mars for the first time, but the first book in the Mars Trilogy was extremely immersive. I could imagine myself riding along with John Boone, Maya Toitovna, and the rest of the First 100 as they explored the red planet and built a new home. Although this series did continue with two other books, by the time I got to Blue Mars, I started to lose interest in the series as the red planet became more earth-like and the feel of the story changed from colonizing a new world to politics and building a government. I reread Red Mars earlier this year, and one thing that stood out to me was that there was so much I missed when I read it as a teenager. I didn’t have the life experience to really understand the characters or the situation they were in. As a teenager, I saw it as a cool story about people living on another world, but as an adult, I could relate to the characters better and understand the situation they went into. I could also better appreciate the language that Robinson used. This book made a huge impact on me, and there are days where I want to sit down and write about intrepid explorers trekking across the surface of Mars. 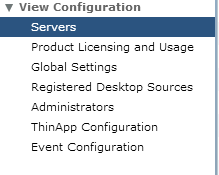 One of the advantages that Citrix had over VMware in the EUC space was the ability to just publish specific applications to users with the MetaFrame/Presentation Server/XenApp line of products. This suite utilized the Microsoft Terminal Services/RDSH roles on Windows Server to present users with centrally hosted and managed applications as if those applications were installed locally on their computer. 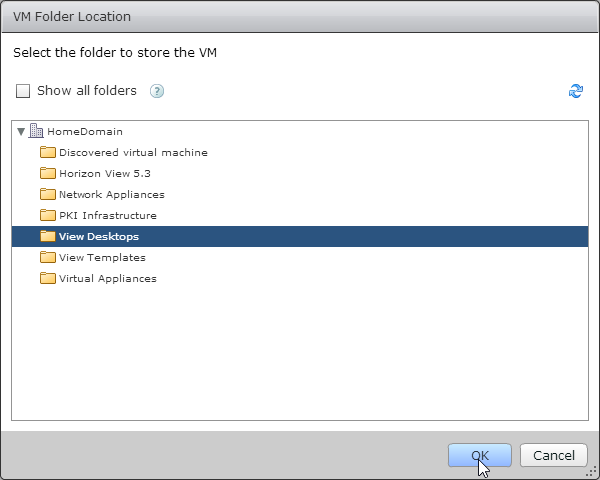 Application publishing was one of the new features that VMware added in Horizon 6.0 when it was released earlier this summer. 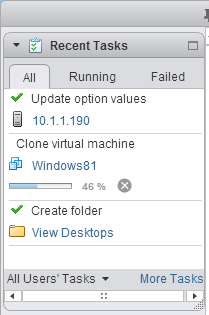 Like XenApp, this feature relies upon Windows Servers with the Remote Desktop Session Host role. 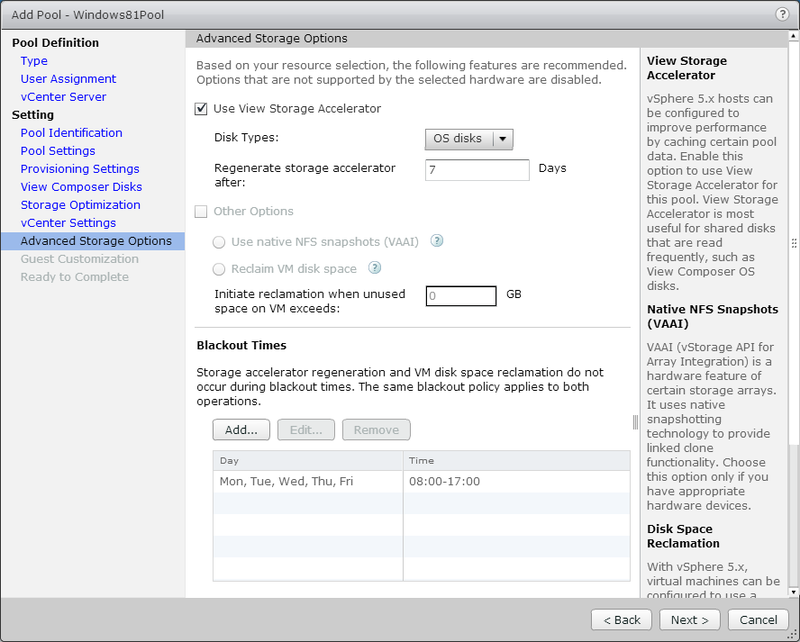 The new application publishing feature reuses a lot of the infrastructure that is deployed to support virtual desktops. 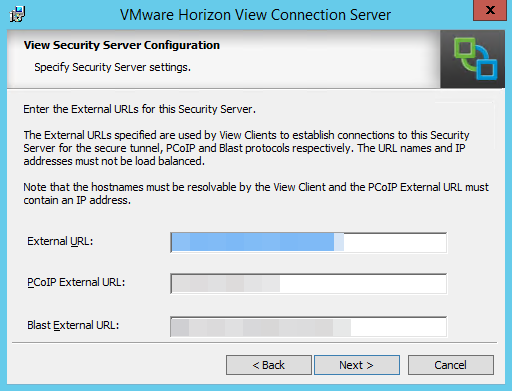 This feature utilizes the same connection servers and security servers as the virtual desktop environment, and access to the published applications is done through the Horizon Client. This provides a single point of management for the entire environment. Application publishing technology is not new. Citrix and Microsoft have both had versions of this technology for some time. Many of the reasons for using those programs also apply to the Horizon application publishing feature. You want to provide secure access to specific applications to remote users. These are just a few of the reasons to publish out applications, and that list is by no means exhaustive. The licensing model for publishing applications from servers using Remote Desktop Services is different from the licensing model for virtual desktops. Like virtual desktops, Remote Desktop Services is not covered under the standard Windows licensing, and Microsoft requires separate RDS CALs to enable this feature on Windows Servers. 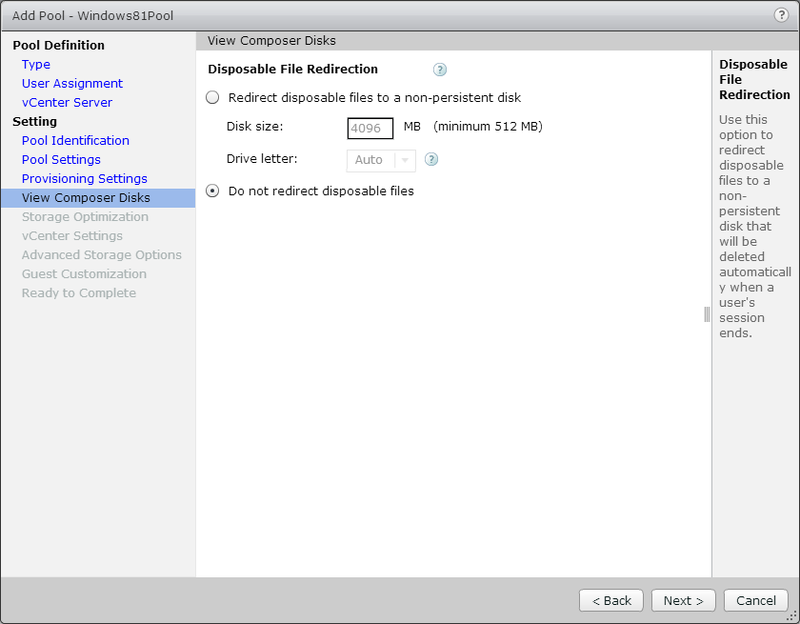 A separate license server is required to manage the RDS CALs. If this license server is not available, the RDSH services will shut down after the trial period expires. 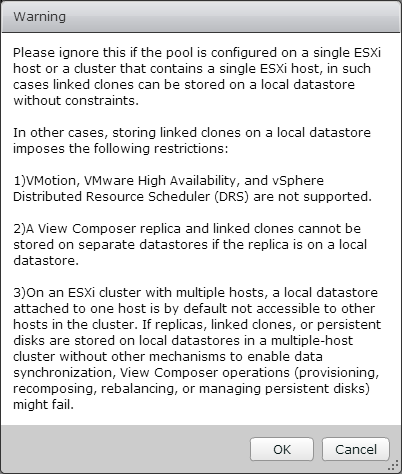 Configuring the RDS license server is beyond the scope of this series, but there is a good walkthrough here. More information on licensing Remote Desktop Services can be found on the Microsoft site, and you should contact your Microsoft licensing rep if you have any questions. The whitepaper in the link also covers licensing Microsoft desktop applications such as Office in RDS environments. 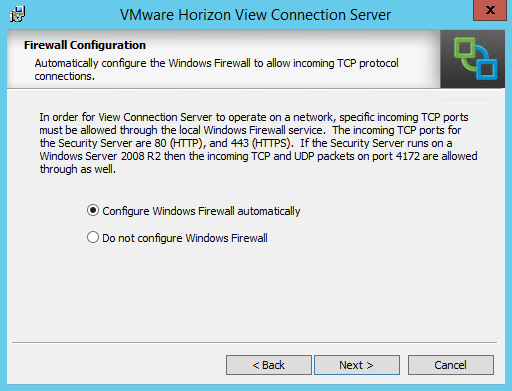 The next article in this series will cover how to configure a Windows Server as an Remote Desktop Session Host and add it into Horizon View as an application host. Publishing out applications will be covered after that, and the final article in this series will cover how to access published applications from within a Horizon View virtual desktop. 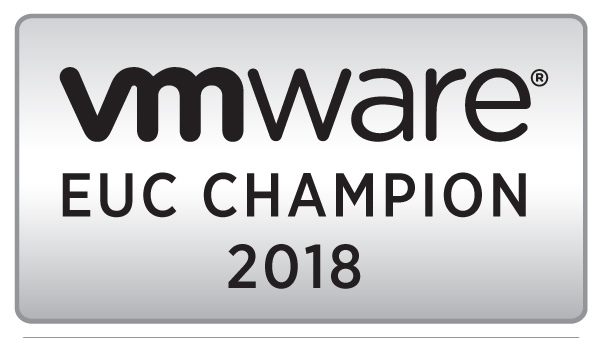 At the last Wisconsin VMware User Group meeting, there was a spirited, yet friendly, discussion between one of the leaders and a VMware SE whether people should use vCenter Orchestrator or PowerCLI. The discussion focused on which was better to learn and use for managing and automating vSphere environments. That conversation got me thinking about what the “right tool” is and how to select it. So what is the right tool? 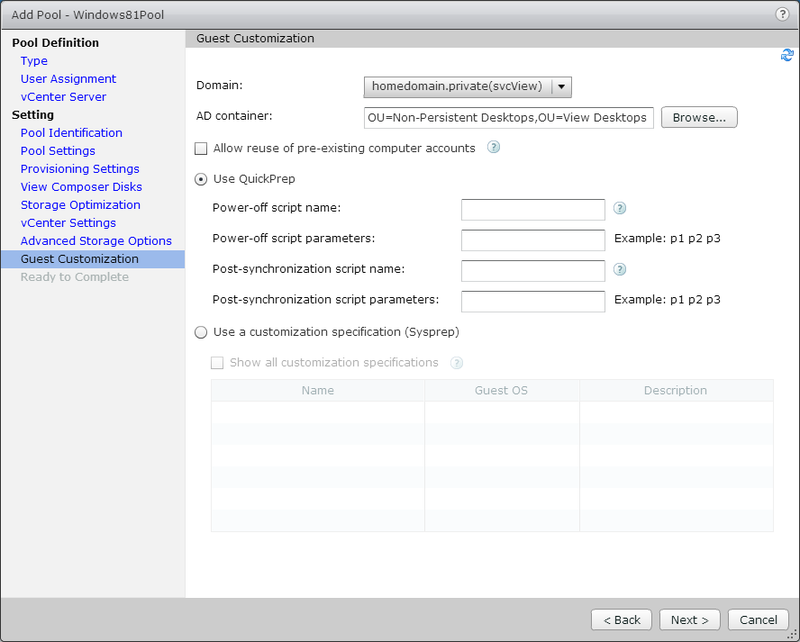 Is it Orchestrator? 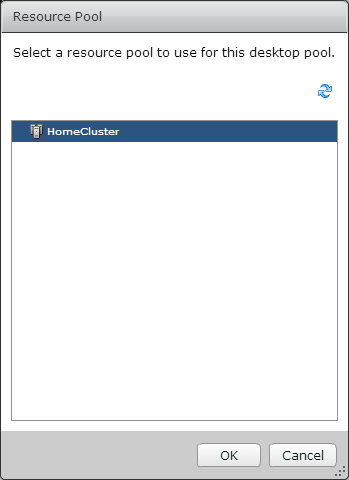 PowerCLI? Or something else? As with anything else in IT, the answer is “It Depends.” The automation engineer’s toolbox has grown significantly over the years, and before you can really answer that question, you need to understand what tasks you’re trying to accomplish and the capabilities of the different tools. Not all automation tools are intended to be used the same way, and using one does not preclude using another to supplement it. 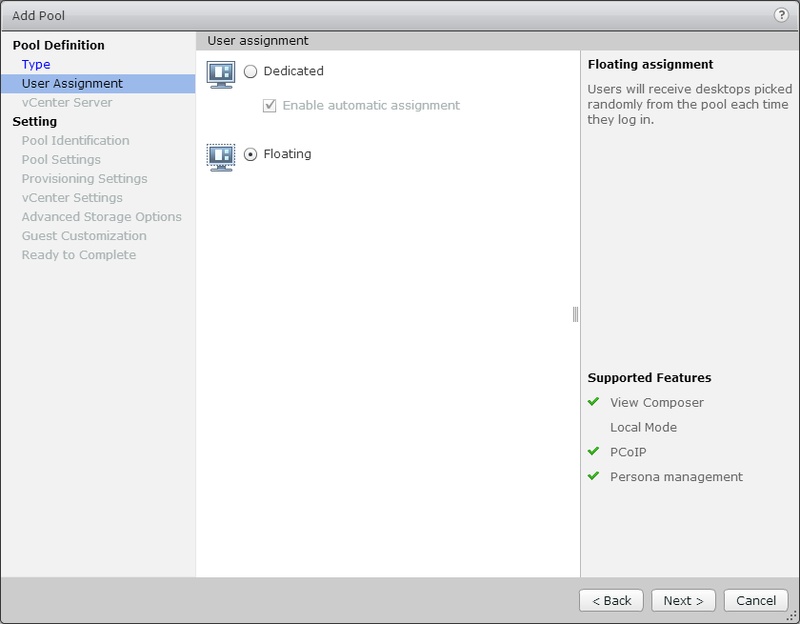 vCenter Orchestrator, for instance, is a workflow automation tool with a number of canned workflows for handling routine tasks in vSphere, and it is the underlying automation engine for the vCloud vRealize Automation Center. But it also includes plugins for interfacing with and/or managing other systems – including PowerShell scripts on other hosts. It is great for tasks that may be run multiple times, either on-demand or scheduled, but it may not be the right fit for quickly automating a one-off task. 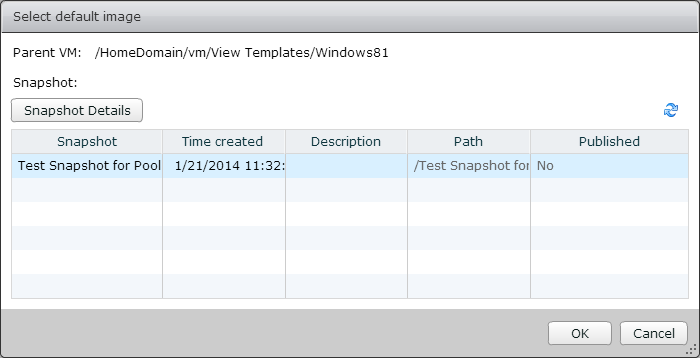 PowerCLI, on the other hand, is based on PowerShell. It is a great command line shell with powerful scripting capabilities. Like Orchestrator, it is extensible, and Microsoft and other vendors have released their own PowerShell modules. 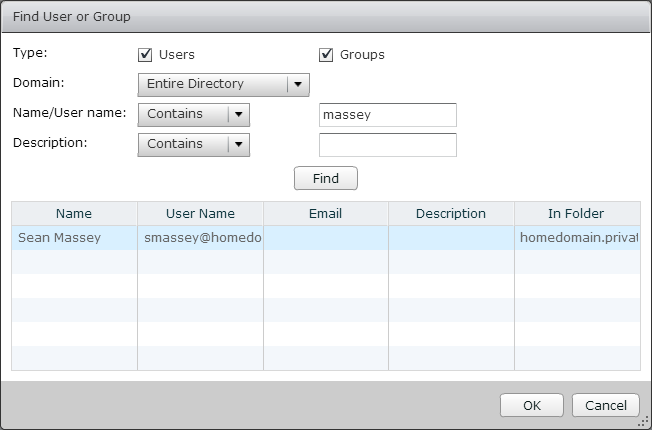 This allows an administrator to automate a large number of 3rd-party systems from a single shell. But while it has some workflow capabilities and even a configuration management tool in Desired State Configuration, it isn’t necessarily the best tool for large scale orchestration or providing the front or middle tiers for large scale batch processing, enterprise self-service, or orchestration. These are just two examples of the tools that you can pick from when automating your environment. In the last couple of years, VMware has significantly expanded the number of scripting languages that they support by releasing additional SDKs for a variety of programming and scripting languages. I should point out that neither of the two camps in this conversation were wrong. An admin should ideally know of multiple tools and when to use them to maximum effect to solve a problem. A lot of the automation that I’ve done at $Work has used both PowerShell, including PowerCLI, and vCenter Orchestrator working together to accomplish the tasks. I use PowerShell to do almost all of the heavy lifting against a variety of systems including Active Directory, Exchange, vCenter, and even Microsoft Online Services. The scripts are usually less than 200 lines, and my goal was to follow something similar to the Unix Design Philosophy where each script specializes in one specific task. This, in my opinion, makes it easier to modify, add new features, or reuse code in other jobs. 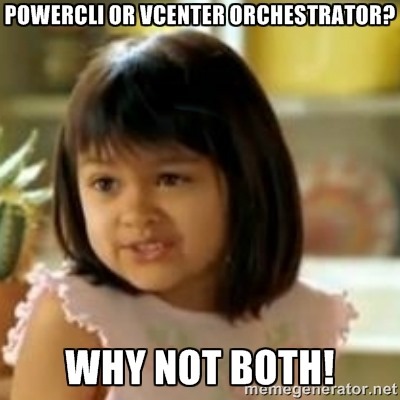 I use vCenter Orchestrator for three things. The first is to tie together the various scripts into workflows. The second is to act as a job scheduling agent since I don’t have something like UC4 or Tidal in my environment. The third is to enable me to offload tasks to developers or the help desk without having to give them any additional rights on other systems. By utilizing the strengths of both Orchestrator and PowerShell, I’m able to accomplish more than just relying on one over the other. This week’s VDM30in30 recipe combines everyone’s favorites – chicken, bacon, BBQ sauce, and cheese into a single delicious dish that can be prepared in the oven or on the grill. This recipe started off as an attempt to replicate a similar dish from a local restaurant. That restaurant, which is no longer in business, had a similar dish as a nightly special. My wife loved it, and she said that she thought it was something that we could make at home. 1. Prepare your grill for direct cooking over medium heat. Oil the grill grate to prevent chicken from sticking. 2. Cook chicken for 8-10 minutes until internal temperature reads 165 degrees with a thermometer, flipping once halfway through. 3. Apply BBQ sauce to chicken,and then top with bacon and cheese. 4. Cook for another 2-3 minutes until sauce has thickened and cheese has melted. 5. Remove from grill and allow to rest for a few minutes before serving. 2. Place chicken in a shallow baking dish. 3. Bake chicken for 25 minutes or until temperature reads about 165 degrees with a thermometer. 4. Apply BBQ sauce to chicken,and then top with bacon and cheese. 5. Bake for another 5-8 minutes or until the internal temperature of the chicken has reached 165 degrees. 6. Remove from the oven and allow to rest for a few minutes before serving. Today is November 15th, and we’re halfway through the month. That also means we’re halfway through VDM30in30. I’m looking forward to seeing what comes in the last half of the month. At the Chicago VMUG User Conference two months ago, I happened to tweet something during Nick Marshall’s morning keynote that was inferred as volunteering to write a book. There needs to be a “Mastering Horizon Suite” book in the same vein as @scott_lowe and @nickmarshall9 “Mastering vSphere 5.5” book. Although that project did not pass the spouse acceptance test, and other priorities prevent me from committing the time to take on a project of that magnitude, I have been thinking about smaller writing projects. One of the questions that I’ve been trying to work through is do I pitch ideas to various tech book publishers, or do I publish the book myself using self-publishing options from Amazon, Barnes and Noble, and other companies? There are benefits and drawbacks to each option. Publishers have resources for editing, reviewing, and marketing books, but the schedules can be very tight to fit the deadlines. Self-publishing provides more freedom to write on your own schedule, but the author is responsible for finding their own editor. There is a financial component to this model as well. A publisher may provide an advance, but it may be a while before you see any royalties, and that is only if the book makes a profit. Self-publishing provides no money up front, but you get to keep everything you make from the sale of the book. These aren’t the only items that need to be considered when choosing whether to work with a publisher or self-publish. There are a lot of factors that need to be taken into consideration. What are your thoughts? Please share on Twitter by tweeting me at @seanpmassey. 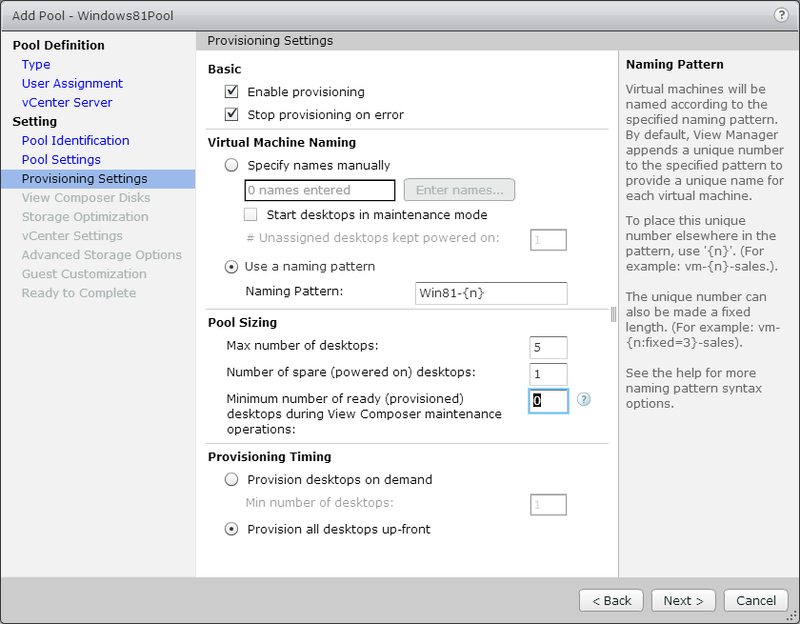 VMware introduced support for Windows Server 2008 R2 virtual desktops in Horizon View 5.3. This support wasn’t enabled out of the box. It required an administrator to edit the View LDAP database to enable the feature and a special command-line only installation of the agent on the target desktop. 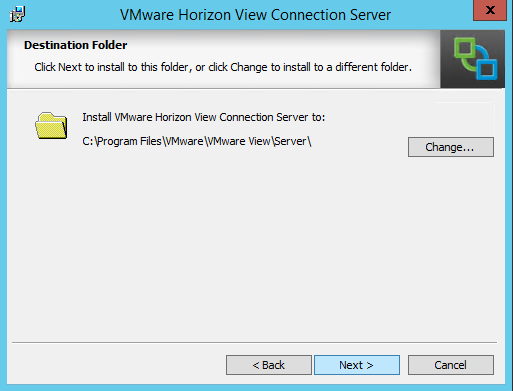 Horizon View 6 brought many new changes, including better support for Windows Server desktop. The first patch set also added better support for this feature. 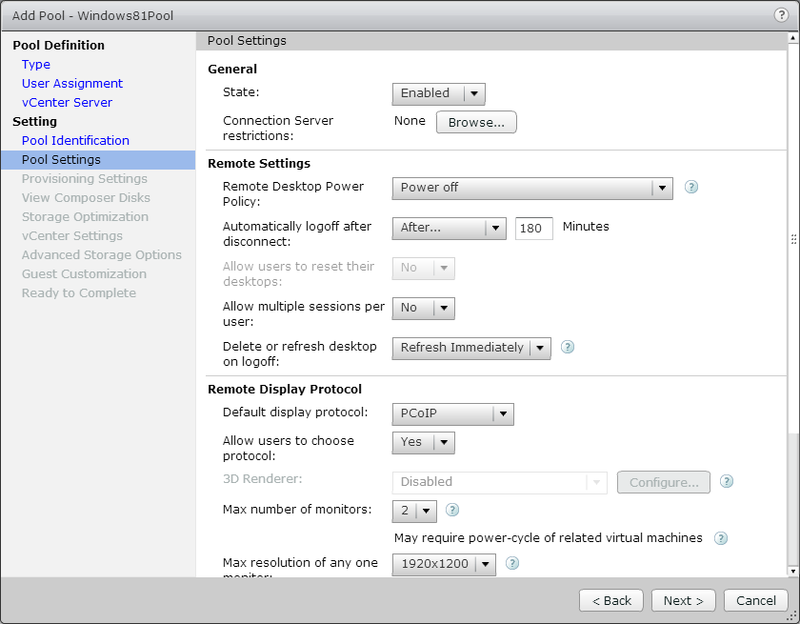 Why Use Windows Server 2008 R2 as a Desktop OS? Historically, Microsoft licensing for virtual desktops has been a pain. In the past, it required connecting endpoints to be covered under software assurance or users to be covered under expensive subscription-based licensing, and there were no service provider licensing options. Although some of this appears to be changing with the latest per-user licensing SKUs that will be available on December 1st, 2014, the service provider side still hasn’t been fixed. From a cost perspective, there are some benefits as well. 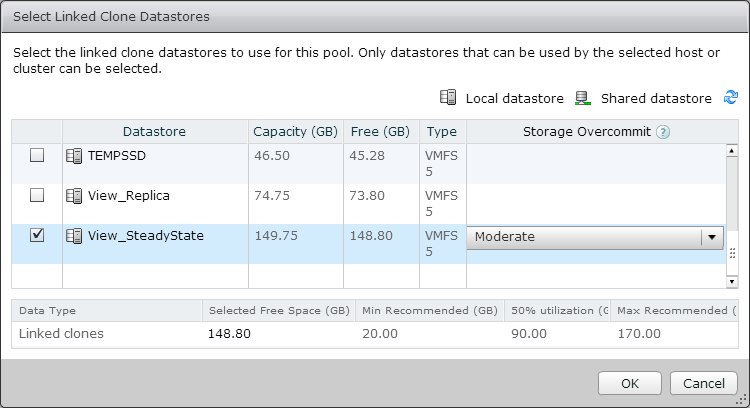 Windows Server Data Center licensing allows for unlimited Windows instances on licensed virtual hosts. This can generate significant savings compared to VDA subscriptions. Note: I am not an expert on Microsoft licensing, and the features and terms of Microsoft’s licensing can change frequently. Please contact your Microsoft representative if you have any questions on licensing products for virtual desktop environments. 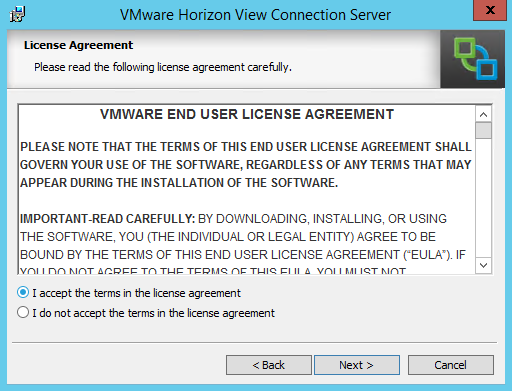 Enabling Windows Server 2008 R2 desktop support have been streamlined from Horizon View 5.3, and manual edits to the LDAP database are no longer required. 1. 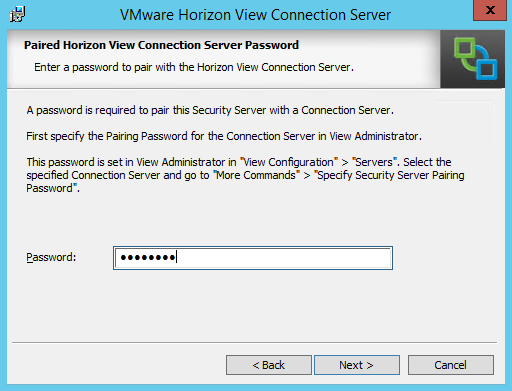 Log into the Horizon View Administrator console. 4. 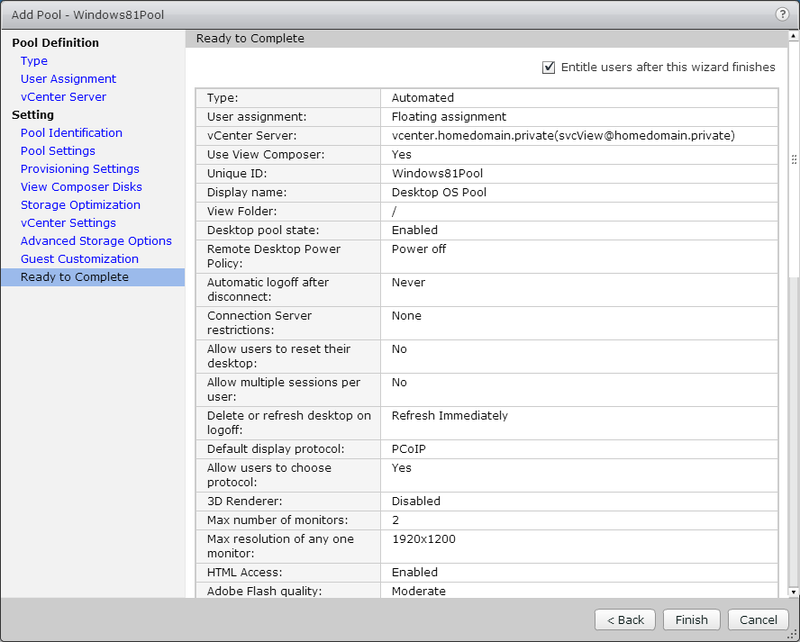 Check the Enable Windows Server 2008 R2 Desktops checkbox and click OK. 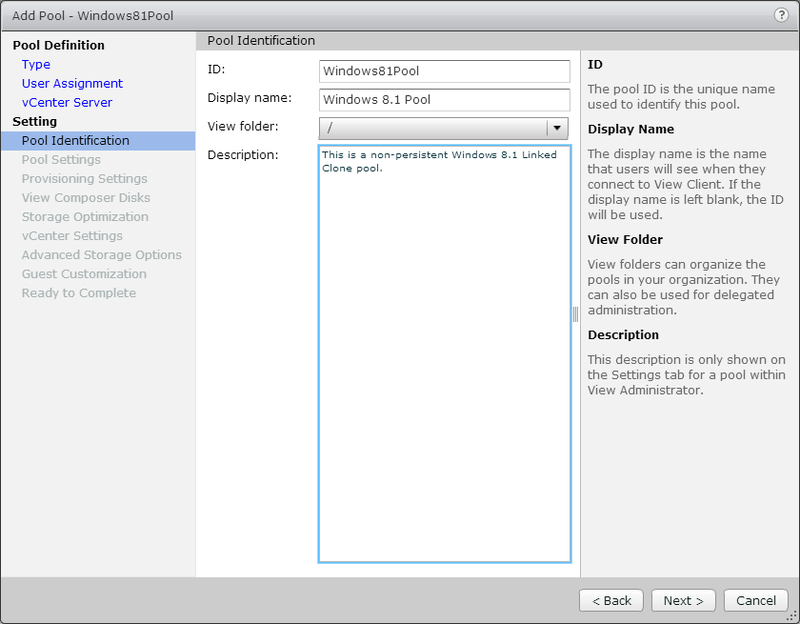 The process for installing the View Agent on Windows Server desktops has also been streamlined. Installing the agent in View 5.3 required a command-line installation with a special switch to force the installer into desktop mode as the installer was geared for servers with the RDSH role. That has changed as well, and the installation process for Server 2008 R2 desktops is now the same as installing it on Windows 7/8/8.1 virtual desktops. 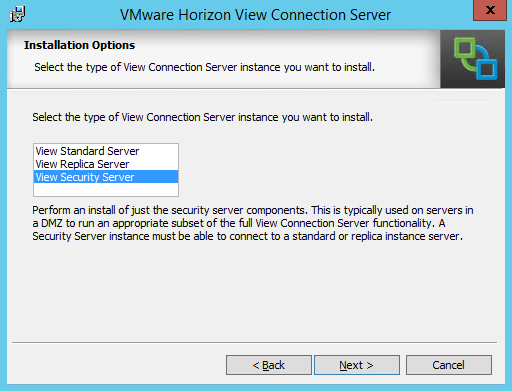 The View Security Server is VMware’s method of addressing remote access. 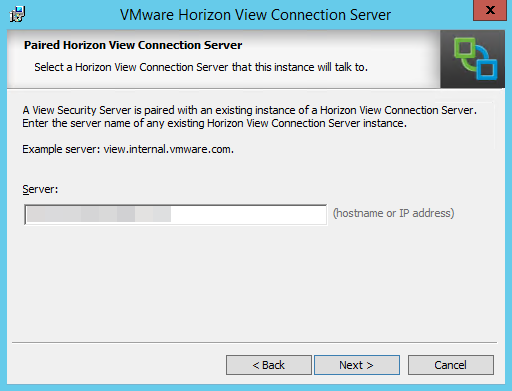 This component of the Horizon View environment contains a subset of the Connection Server components, and it is designed to sit in a DMZ and act as a gateway for Horizon View Clients. It’s essentially a reverse proxy for your View environment. 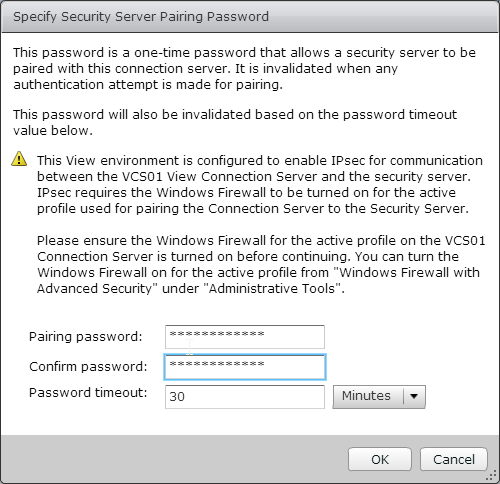 Note: Pairing passwords can time out or be invalidated by hitting the back button during the Security Server installation after the pairing password has been entered. If this happens, the password will need to be recreated using the steps above. 1. Double-click the installer to start the installation. Note: This also configures the IPSec Rules that are needed for secure communication between the Security Server and the Connection Server. 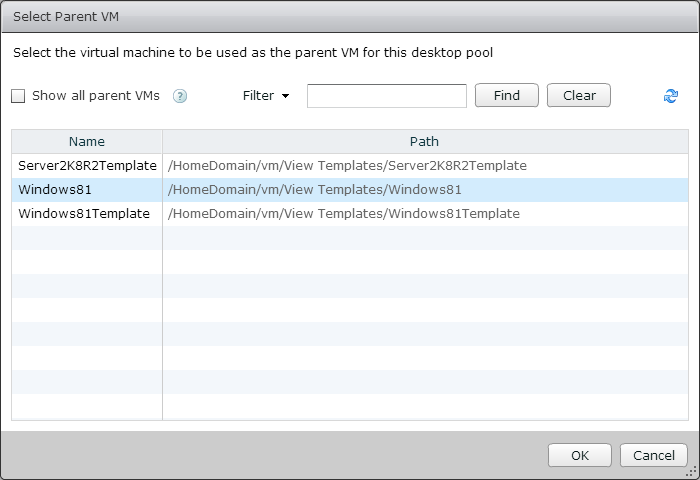 Horizon View has a few different types of desktop pools. Each pool handles desktops in different ways, and they each have different purposes. The type of pool that you select will be determined by a number of factors including the use case, the storage infrastructure and application requirements. 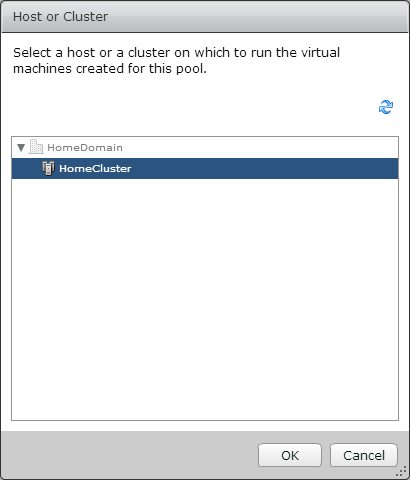 Full Clone Pools – Each virtual desktop is a full virtual machine cloned from a template in vCenter. 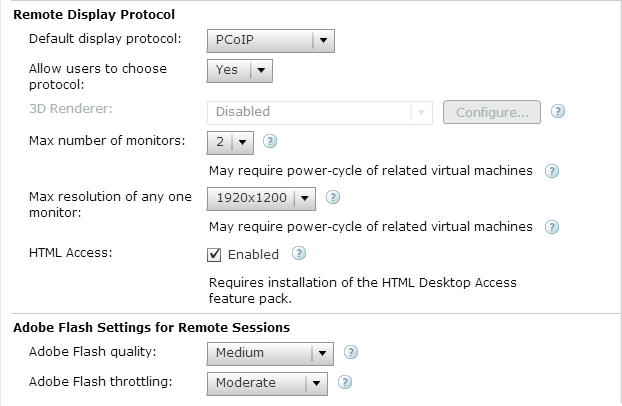 The virtual machines are managed by View Connection Servers. 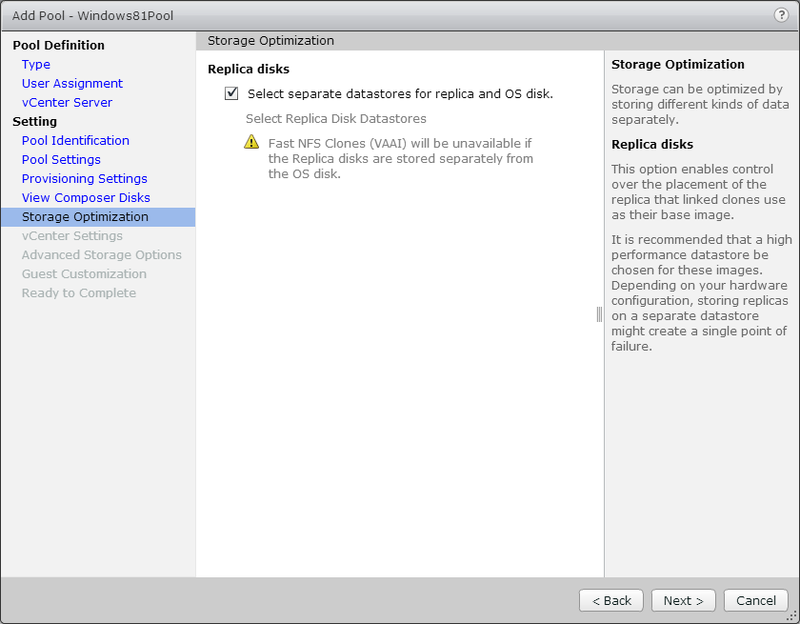 Linked Clone Pools – Each virtual desktop is based on a snapshot and shares its disk with the parent virtual machine. Changes to the linked clone are written to a delta disk. 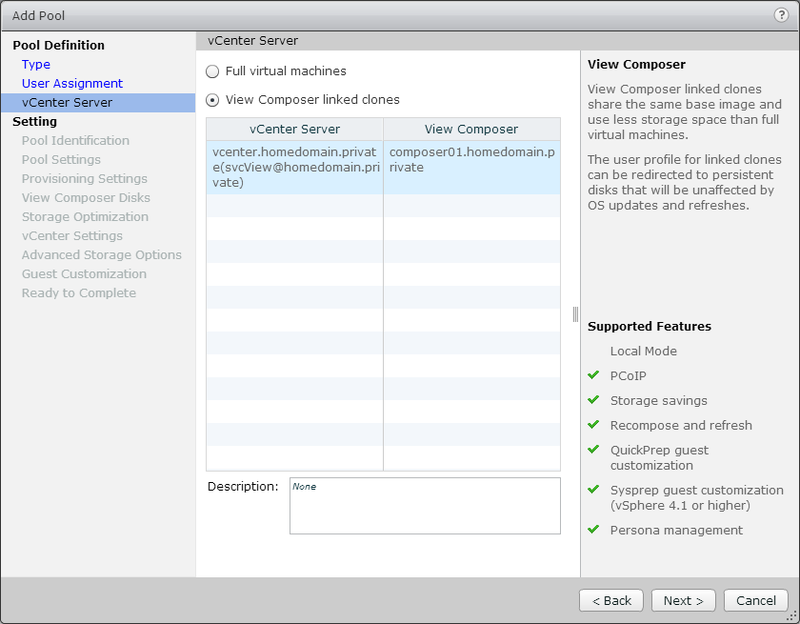 The virtual machines are managed by View Composer. Manual Pools – The machines that make up the manual pool consist of virtual and/or physical machines that have had the View Agent installed. These machines are not managed by View. 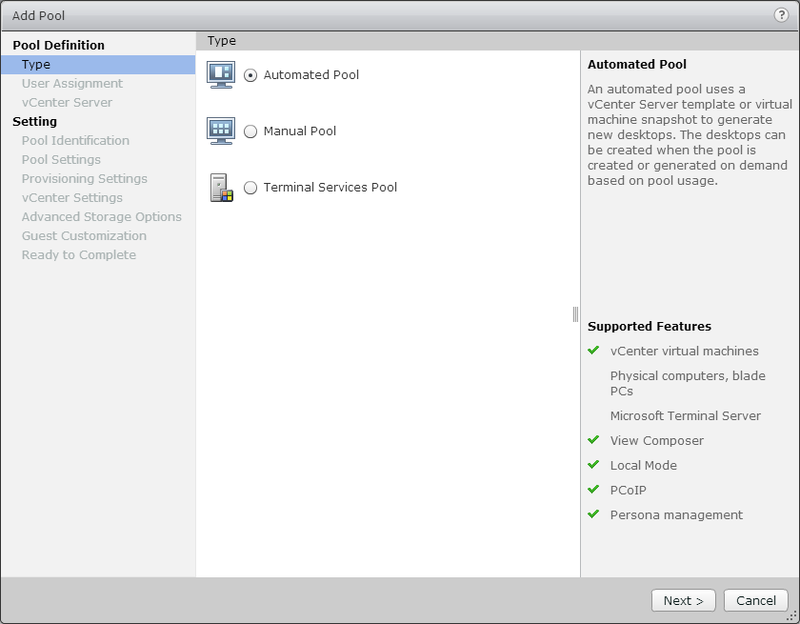 Terminal Services Pool – The machines that make up these pools are Windows Servers with the Remote Desktop Services Role installed. For this walkthrough, I will be doing an Automatic Assignment Linked-Clone desktop pool. 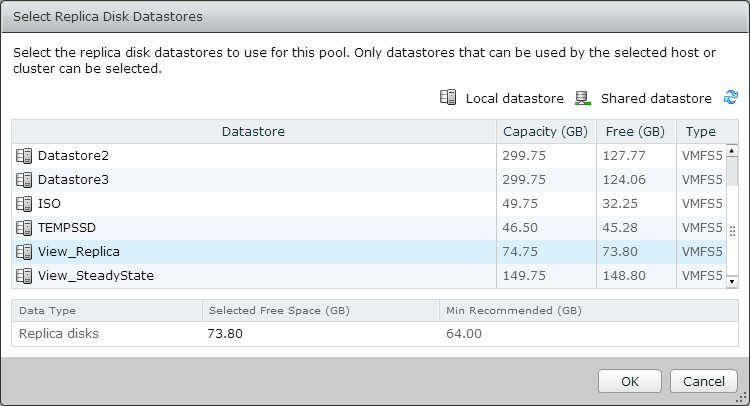 These pools are usually referred to as Non-Persistent Desktop Pools. 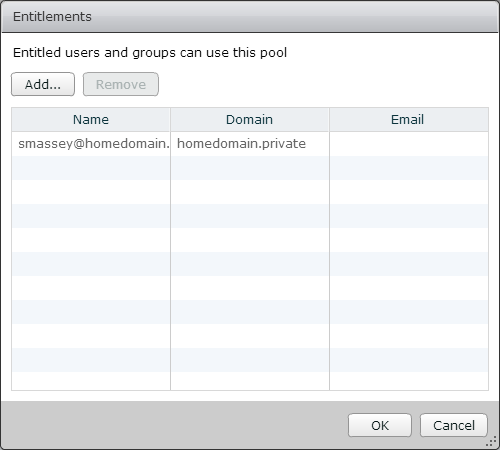 Before you can set up a Linked Clone pool, View Composer will need to be installed and configured. 1. Log into View Administrator. 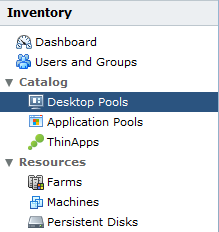 Under Catalog, select Desktop Pools. I realize that there are a lot of steps in the process of creating a desktop pool. It doesn’t take nearly as long as it seems once you get the hang of it, and you will be able to fly through it pretty quickly. 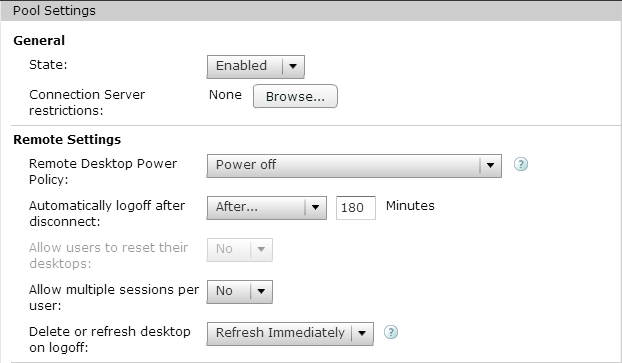 These steps can also be automated using the View PowerCLI cmdlets from any Connection Broker in the environment.